Anders Olsson, literary historian and writer. Anders Olsson was born 1949 in the city of Huddinge, just south of Stockholm. In his youth he studied Nordic languages, literary history and philosophy at the universities of Uppsala and Stockholm and was one of the founders of the cultural magazine Kris, which contributed to a renewal of the literary climate during the 1980s. He has been working as a critic since the late 1970s. He made his debut as a writer in 1981 with Mälden mellan stenarna: litterära essäer ("The Grain between the stones : literary essays"). His first collection of poems was published in 1984 and is called Dagar, aska ("Days, ashes"). By then he had also taken his phD with a dissertation named Ekelöfs nej (1983; "Ekelöf’s no"). In this he presents basic themes and intertextual connections within the Swedish poet Gunnar Ekelöfs writing. The interest remained and later blossomed in the work Gunnar Ekelöf (1997) as well as in the editorship for the Swedish Academy’s publication of Ekelöfs gathered poems in 2015. Of similar importance is the authorship of the Finland-Swedish modernist poet Gunnar Björling and in 1995 Olsson published Björlings writings in five volumes. The same year Olsson also published the ground breaking study Att skriva dagen : Gunnar Björlings poetiska värld ("Writing the day : the poetical world of Gunnar Björling") in which he analyses Björling's sence of urgency in life as well as his most important poetical techniques. 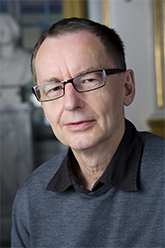 Anders Olsson was a Professor of Literature at the University of Stockholm since 2004 and have in his research examined fundamental elements in the development of modern literature, such as the death of God and poetical nihilism in Läsningar av Intet (2000; "Readings of nothingness"), the art of writing in fragments in Skillnadens konst (2006; "The Art of Difference") and modern exile literature in Ordens asyl (2011; "Asylum for words"). In Tankar om läsning (2015; "Thoughts about reading") Olsson reflects on the conditions for reading and the role time, space and memory plays in this context, for example in the works of Marcel Proust. Anders Olsson has published seven collection of poems, most recently men så oändligt lätt att svara dig (2010; "but how endlessly effortless to answer you"). In the year 2008 Anders Olsson was elected to the Swedish Academy as successor to the writer Lars Forssell. Curiosity: Since several decades Anders Olsson begins every morning with a ten minute long Zen meditation.